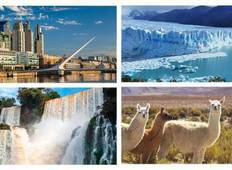 Find a Sightseeing trip that explores Argentina And Brazil. There are 11 tours to choose from, that range in length from 3 days up to 26 days. The most popular month for these tours is May, which has the most tour departures. "Had a wonderful time in Buenos Aires and Iguaza. Micaela, my guide, contributed a..."
"El tour resultó espectacular; me encantó ver las cataratas en toda su dimensión;..."